The county was battered by Storm Ali last Wednesday with many roads blocked by trees and power cut from homes for days. 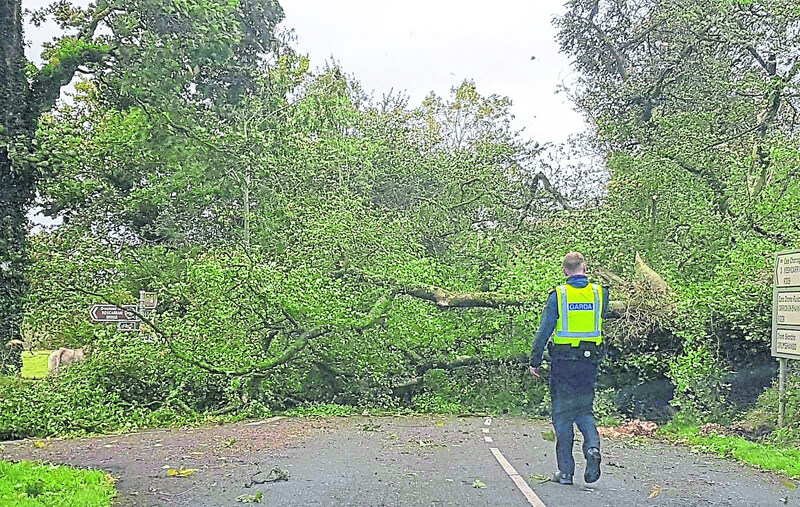 Leitrim Fire Service, Gardai and Leitrim County Council had a busy morning as roads were blocked around the county with fallen trees, power lines were damaged and a lot of homes were without electricity on Wednesday, while others still had no light by Friday evening. There was criticism that the storm did not receive a Red Warning alert winds reached 140 kph. A few days before the storm hit, Manorhamilton Independent Cllr Felim Gurn queried what plans the council had in place for stormy winter season in relation to overhanging trees on roadsides. The council responded saying funding has been received from the TII to deal with six locations along N16. The council also said they have advertised the hedge cutting grant scheme to encourage landowners in cutting their roadside hedges. Cllr Gurn said, “If we don’t act now the trees will take down wires.” Cllr Gurn also commented it will cost more afterwards if damage is done. He said people are no longer complaining about the state of roads, but about overhanging trees. In Ballinamore on Monday, Council Engineer Darragh O’Boyle said a number of hedgecutting notices have been sent out and the council will be following up on them shortly.